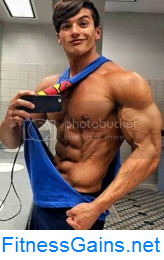 200 lbs of lean muscle: His physique is admirably built, but this handsome fitness model has even more fascinating skills and personality traits. Taylor R. comes to AllAmericanGuys from the state of North Carolina. He's a part time model and small business owner who enjoys interacting with people. He also enjoys doing charitable work and working with the disable. For fun Taylor enjoys outdoor activities, boating and also working out. You find many high quality photos and videos of Taylor R. here on AllAmericanGuys. The full Deltoid Dominance Workout is available at www.GregPlitt.com. The GregPlitt.com Members Section contains over 250 hours of video, including 62 instructional workout videos, $9.95 a month for full access. The full Never Looking Back Workout is available at www.GregPlitt.com.